Although he remains almost unknown to American audiences, Shin Joong Hyun achieved legendary status long ago in his native South Korea. Now, his music can be heard in the States with the release of “Shin Joong Hyun & Yup Juns” by Lion Productions and distributed by Seattle’s In The Attic record label. Born in Seoul in 1938, Shin spent several years living with his father and stepmother in both Japan and Manchuria. After becoming orphaned at age 15, he returned to the city of his birth and slowly began plotting a career in rock and roll. Shin became the first rock star South Korea had ever seen, and his first prominent band, Add 4, was the first native rock band South Korea ever heard. Although Shin was never completely original when compared to Western music, he pioneered style after style for Korean-speaking audiences. He embodied the rebellious rock and roll attitude, too. After failing to produce a puff piece for South Korean President Park Chung Hee in 1972, Shin found himself arrested on marijuana charges, then banned from public performances for some time after his release. Like many classic Western rock performers, Shin’s journey took many unexpected twists and turns. 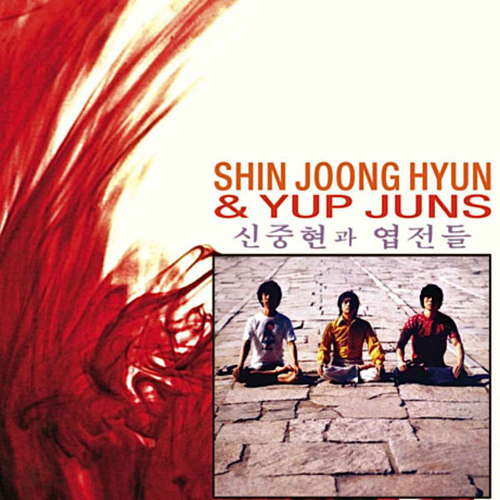 This version of “Shin Joong Hyun & Yup Juns” was originally recorded in 1974 as a very limited-edition and promotional item, intended for radio stations. When the record failed to catch fire, Shin’s Korean record label dropped it, and the band had to re-cut the material. The original version was, until now, almost impossible to find in both the East and the West. And that is a shame, because the record shows an inventive band leader at the top of his game. Shin earned renown for his guitar playing, and he is only the sixth guitarist in history to earn recognition from the Fender guitar company’s Custom Shop Tribute Series. His performance pushes ahead of the beat and then lags behind it, creating suspense, urgency, and at times, reggae-style upbeat emphasis. Shin’s singing is an equally important, if not as often-praised, element of his music. He borrows intensity from American soul singing, but retains a ragged edge to his tones and a unique, twisting manner of phrasing that remains his alone. The “Shin Joong Hyun & Yup Juns” set is not as brazenly psychedelic as some of Shin’s earlier work, but it does make use of bold sounds. “I Love You,” a simply titled song with an odd, chanted melody line, features bells, shakers, and what sounds like dragged chains. The album’s finale, “Rising Sun,” starts conventionally enough with melodic guitar, but winds its way through rubbery bass, echoed drumming, electric clinking, and whooping flying-saucer noises. The music on this album was not planned as protest music, in the often-used sense of that word. However, Shin was dissatisfied at the time with his career and his relationship to his own country. A “yipjun” is a cheap brass coin, and Shin facetiously thought of himself as cheap and easily replaceable. He was, of course, quite the opposite. “Shin Joong Hyun & Yup Juns” is available on LP vinyl and compact disc from Lion Productions, distributed by Seattle’s Light In The Attic label, at record stores near you. Nice post. I study something more difficult on different blogs everyday. It’s going to always be stimulating to learn content from other writers and follow just a little something from their store. I’d choose to use some with the content material on my blog whether or not you don’t mind. Natually I’ll give you a hyperlink on your net blog. Thanks for sharing.